In the last part we had a look at the guards of the two-handed sword. We did not examine or analyze them any closer, but don’t worry: the time for that will come later. Of course, in the meantime, I invite you to study the positions as closely as you like, and comparing them to the original illustrations. In this part I will take through a quick tour of the material available for this noble weapon, material which in total comprises the teaching of the two-handed sword. Most of these texts give the weapon a rather cursory treatment which is contextually interesting but not necessarily adding much value to the Bolognese material, which is by far more detailed. For this reason I will focus primarily on the two Bolognese sources. We will begin with Marozzo and looking at the Anonimo later. There is a clear reason for doing it this way, embedded in the structure of the teaching. It may come as a surprise to some that much of what Marozzo writes is packaged into sequences of actions called the assalti. These sequences, or forms, are part solo and part pair exercise, likely designed to be performed with an expert student or master. The exact reason why Marozzo chose to use this convention in his books — and indeed the question how much he used these at his sala d’arme remain unknown to us, but as historical martial artists it is our responsibility and job to decipher these sequences, interpret the purpose of every step within them and to learn to perform them with utmost elegance. Right after learning the guards it is the next step to focus our efforts on the assalti. Marozzo gives us three assalti for this weapon. The two first are “pure” forms in a sense, and the third one consists of strette di mezza spada, or “straits of the half-sword”, meaning techniques and their counters executed from a position of crossed swords. 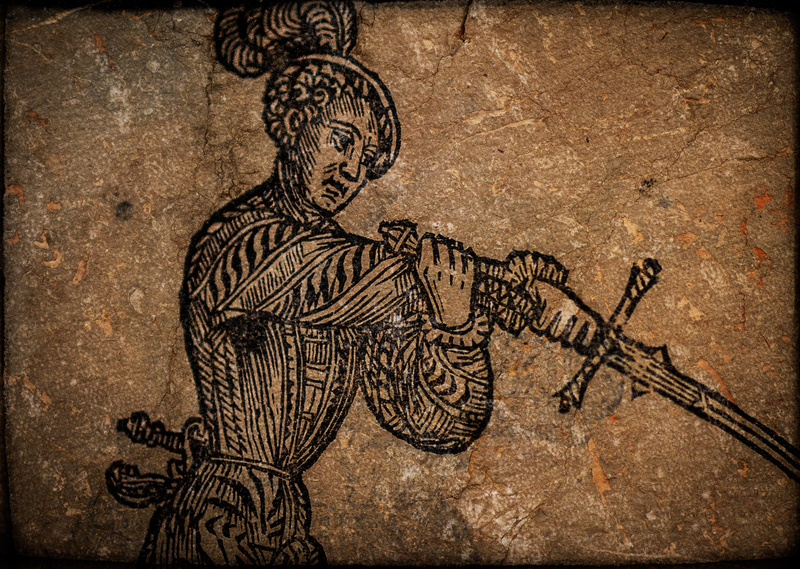 The Anonimo gives us no assalti (as it neither does with other weapons), but only an extensive set of strette. This section is partially missing, but I have hopes for the missing parts to be brough to light as well eventually. But this answers the question why we should begin with Marozzo: the teaching of the Anonimo is a natural extension to the thirs assalto — the strette — of Achille Marozzo. In the next part I will give you a translation of the Primo Assalto di Spada da Due Mani, or the first assault of the two-handed sword, together with a little bit of analysis and instruction on how to get started with it. I will eventually be making a video of the form as well, but unfortunately you will have to wait until I have the time to produce it. Meanwhile you can watch an old video of the assalto, but only to get yourself into a mood for practice. The execution is rather out-dated and faulty (the video is from 2010), and shouldn’t therefore be used as reference for learning. As another teaser, and to increase the informative value of this post I will offer here the translation of the first part of the first assault. I hope this will act as a digestible appetizer for the future posts. Using the guards and the cuts derived from the single sword, you can see if you are able to understand the instructions. It is a good exercise and gives you an idea of the kind of work that needs to be done to breathe life into the Bolognese tradition. Firstly you need to come to find your enemy with one of these “entries to play” (andari a gioco) that to you is appropriate, after which you will be near the said [enemy]. Now having arrived close to your enemy, you place yourself in Guardia di Testa to go to find the said enemy; but watch well that if he were in Porta di Ferro Alta it is necessary that you feint with a falso pointed outside his sword (with a falso impuntato) to his right side, passing with your left and right foot forwards, together with this step throwing a <span class="glossaryLink cmtt_Strikes" data-tooltip="
Literally "right hand". Refers to strikes that originate from the right (sword-hand) side of the fencer. Mandritto is a roof term for these cuts, but on its own it refers typically to a downwards diagonal cut from the right with the true edge, a mandritto sgualembrato. ">mandritto to the head with a tramazzone, in a way that your sword drops to Porta di Ferro Larga; and then if your enemy attacks your head, you throw your right foot towards his right side and parry with the true edge of your sword, driving in this parry the point of the sword into the face of the enemy; and in one action you pass with your left foot toward his right side throwing a roversofendente atop his head, and your sword will drop into Coda Lunga e Alta with the left foot in front; but if your opponent in this decline [of your sword] attacks your head, draw the left foot close to the right and cross strongly your hands, extending the point of the sword in the face of the enemy and, in this way, you have parried the aforesaid attack; and having parried, you throw the right foot two spans backward and throw a falso dritto from below upwards to the hands of the enemy and, in this strike, the left foot will go strongly behind the right, so that you will be with your sword in Porta di Ferro Alta and the left foot will follow behind the right; and here I want you to await the enemy.